A Macedonian company, Alfa Energo, has sent a non-binding offer to the Czech State-owned electric power utility CEZ Group for its business in Bulgaria. It happened in early 2017, but the offer had not turned into a binding commitment, according to a document that Bivol possesses. Alfa Energo is not on the official list of companies with which CEZ has negotiated. The bidders include the Bulgarian Bobovdol Thermal Power Plant (TPP) linked to alleged energy oligarch Hristo Kovachki, the Czech electric power utility Energo-Pro, which also has business in Bulgaria, Ginka Varbakova’s Inercom and two consortiums: Future Energy/India Power and A & P/STFA. The deal was inked with Ginka Varbakova’s totally unknown Inercom, which caused a scandal in Bulgaria because of the obscure financing and the modest potential of the company. Asked by Bivol whether CEZ Group had received such a non-binding offer from Alfa Energo and whether it had been discussed, the Czech company’s press office said that CEZ had arrangements for non-disclosure with all parties interested in the sale process and that it does not comment on individual participants. In reality, this is a confirmation that Alfa Energo had been involved in the sale process. Alfa Energo’s offer is worth EUR 310 million and it also includes the TPP Varna, estimated at EUR 80 million. In addition, the Macedonians have also proposed to take over CEZ’s debts to the European Bank for Reconstruction and Development (EBRD), amounting to EUR 116 million. The official letter of intent to buy the Bulgarian assets has been sent in late 2017. Bivol’s attempts to obtain a comment on Alfa Energo’s offer from the Macedonian office of Alfa Holding, which is part of the company, were unsuccessful. CEZ’s initial intentions were to sell its business in a bundle and this coincides with the offer of the Macedonians. In the end, however, the TPP Varna was sold separately in October 2017 to a company connected to Danail Papazov, former Bulgarian Transport Minister in the Socialist-endorsed government of Prime Minister Plamen Oresharski. The price was not officially announced, but the Czech newspaper Hospodarske Noviny wrote that the offer was for about EUR 50 million. Who is behind Alfa Energo? In the document with Alfa Energo’s offer, the listed owner is the family of some of Dimitar Trenkov. The manager of the firm, who has signed the offer to CEZ, is named Alexander Zaovski. Alfa Energo has a license in Macedonia for electricity trading. It is presented as part of the Alfa Holding Group, including companies for trading with fuels, chemical products and a financial house. The Macedonian Alpha bears a big resemblance to the Bulgarian Inercom. Neither Trenkov and Zaovski, nor the companies of the Alfa Holding Group are known in Macedonia. They do not have assets and expertise to manage CEZ’ billion-dollar business in Bulgaria that serves over 3 million people, a million more than the population of our southwestern neighbor. The source of the impressive amount of EUR 426 million is not mentioned in Alfa’s offer, but the document states that the company is “able to provide the necessary financing to pay in cash” and would not depend on third parties for financing the transaction. The explanation of the company for wanting to buy CEZ because it wanted to “stabilize the energy situation in Macedonia” does not sound serious. 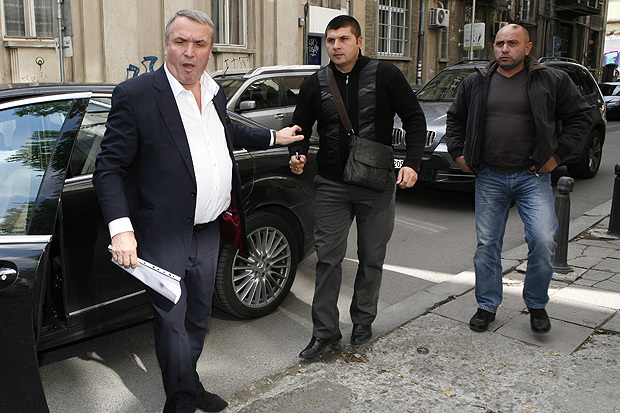 However, the interests of a well-known Bulgarian oligarch and his Serbian partners seem to lurk behind Alfa. ENERGY FINANCING TEAM (EFT), a company which is linked to Bogomil Manchev and Serbian oligarch Vuk Hamovic, is registered at the same address as Alfa Holding. EFT is a well-known player in Balkan electricity trading and years ago was the subject of an investigation by the Prosecutor’s Office in Bulgaria for inflicting damages for the country’s National Electric Company (NEK) through unprofitable deals. In the end, this investigation was crushed and terminated in 2012, during the term in office of current Bulgarian Prosecutor General, Sotir Tsatsarov. A company of Vuk Hamovic with the same name, EFT Ltd., has also been investigated in the United Kingdom by the Serious Fraud Office (SFO) for diverting USAID for electricity for Montenegro and for corruption. However, the investigation has been terminated without charges being pressed against the businessman. Bulgarian energy boss Bogomil Manchev is mostly associated with the huge amounts received by his consultancy company Risk Engineering for the now-terminated Belene Nuclear Power Plant (NPP) project. In a US Department of State diplomatic cable from 2006, he is named as a representative of the “energy mafia”. In 2013, Manchev was charged with misappropriation of BGN 8.6 million from the Belene NPP project, but in 2015 the charges were dismissed due to lack of evidence. Either way, the energy oligarch is not seen as someone close to the current ruling clique and its business circles. The eventual acquisition of the control of over one-third of the Bulgarian electricity distribution network by Manchev and his lobby would hardly appeal to the government of third-term Prime Minister Boyko Borisov and it is not part of its interests. There is, however, a Czech connection behind Alfa as well. The domain of the group has been registered by a web hosting and site creating company in the Czech Republic, a check by Bivol shows. Nevertheless, there are no indications in Alfa Energo company documents that it has a business in the Czech Republic. More interesting links pop up from the person for contacts listed in the Macedonians’ offer to CEZ. This is Ota Stros, who has given his personal email as well as a phone in Prague. The company Earth Energy, s.r.o., in which Jana Stros is a former owner, answers the same phone. Even more interesting, however, is the current owner of the company, Vaclav Franz. He has two joint ventures with Oleksandr Tymoshenko. Bivol’s colleagues from the Czech Center for Investigative Journalism established that Oleksandr Tymoshenko is the husband of former Ukrainian Prime Minister Yulia Tymoshenko, known as the “Gas Princess”. In 2012, he won political asylum in the Czech Republic after his wife, Yulia, was jailed by Yanukovych’s regime.